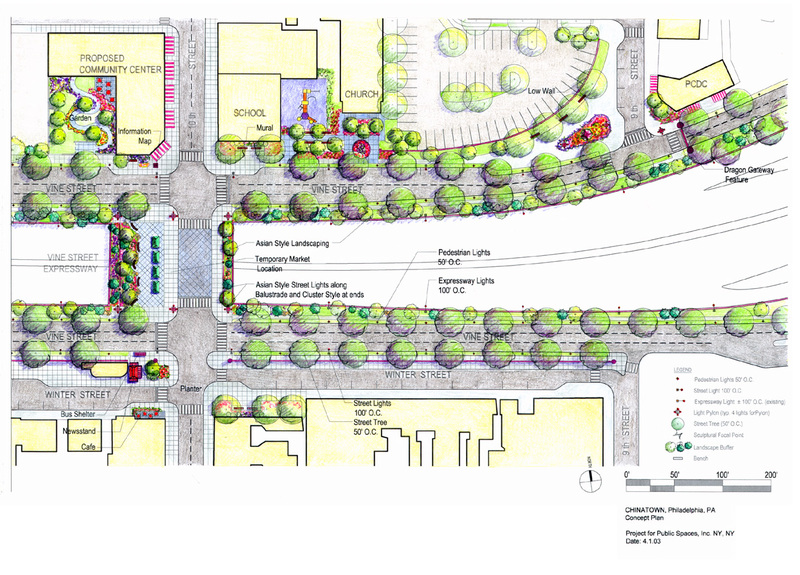 The plan for the Chinatown section of Vine Street. 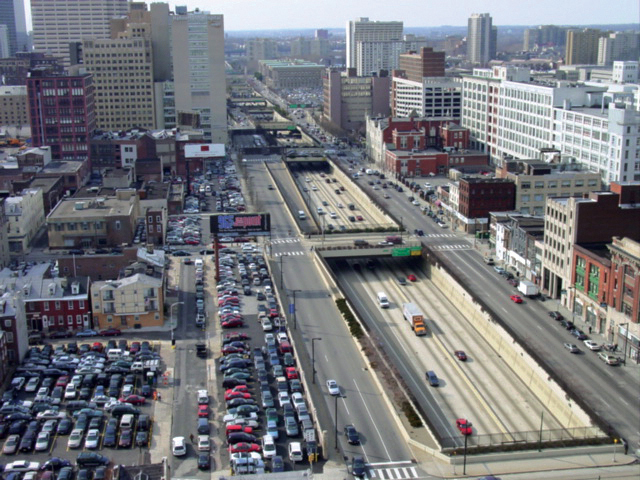 Philadelphia's Vine Street Expressway is a sunken highway that, like all too many urban thoroughfares, divides its surrounding neighborhoods and discourages street life. Even the surface-level streets on each side of the expressway feel like highways, with their wide lanes, fast-moving traffic, and poor pedestrian amenities. Such an intimidating place can still be turned around, and PPS worked with Philadelphia's Center City District (PCCD) to do just that. Luckily, the Vine Street corridor passes through several key places that can link neighborhoods together by serving as destination points. This project focused on creating "special places" in crucial locations along Vine Street, which can have a catalytic effect in the knitting the neighborhoods along the corridor back together, and humanizing an urban highway. These key places include two of Philadelphia's historic squares Franklin Square and Logan Circle, and Chinatown, all of which have a tremendous potential to become more active and attractive destinations. These revitalized places, together with a humanized, pedestrian-friendly treatment of the surface streets, propose to transform Vine Street into an urban boulevard that energizes and connects the neighborhoods along it. Working closely with PCCD and numerous local stakeholders in both meetings and Placemaking workshops, PPS developed a series of concepts for enhancing Vine Street's major focal points and softening the street itself. The vision for Vine Street was presented in public meetings, and summarized in a detailed report, which included short-term action plans for the three main destinations, rendered plans, and a proposed boulevard scheme. Conducted with the generous support of the William Penn Foundation, this project is now in its implementation phase, where a small implementation grant was used to leverage funding major traffic and open space planning and improvements in Logan Circle. Logan Circle is one of two historic squares located along Vine Street.